Everyone by now has heard the term “Street Art”, and is familiar with artists such as Banksy or Shepard Fairey. In SW Florida, including Cape Coral, Ft Myers and Naples, you may not see many examples of street art, but you can bet its coming. I’m a huge fan of the street art movement and I participate in it myself quite often through street fairs, exhibitions and festivals. So in no way do I think having a different passion takes anything away from street art. But when it comes to mural work I prefer the old school brush technique. I think some things are timeless and when placed side by side I can see how traditional painting and spray painting may look completely different but compliment themselves in many ways. For me, the old school brush method is a bit more my style, its easier to see an individual artist in both the technique and color schemes. The palette is much more open, allowing the artist to mix just about any color. While there are many more options available to spray can artists, that palette is still limited to a certain number of blues, reds, greens and yellows. Techniques also, in my opinion, are more available to a brush artist than a spray artist. 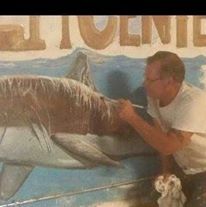 For many traditional mural artists its easy to see in their work techniques that have been passed down from generation through generation whether through schooling, mentorship or studying an artists technique. Artists such as John Pugh and Wyland have both mastered the traditional method of brushing that you can see their influence in other artists. From an artist point of view, while many street artists share similar techniques, the street artist makes a unique statement through his subject matter and individual style. Style is what allows a street artist to stand out. For anyone thinking about commissioning a mural, both the street art and traditional styles are great options. But as a client, you shouldnt feel that one style is “hot” right now or that street art represents the future while traditional methods are something of the past. Neither one is going away soon and the decision should be based more off of what represents your business or home style and less on what is popular.